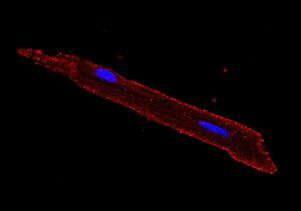 An image of a mouse heart cell shows the presence of the free fatty acid receptor-1 known as FFAR-1, in red, and the nuclei in blue. Studies have shown that a simple treatment called lipid emulsion therapy — fatty acids administered intravenously — can heal damage to the heart after a heart attack or cardiac arrest. But researchers haven’t understood exactly how the treatment works or whether there are more effective ways to repair the heart. Scientists have known that free fatty acid receptor-1, known as FFAR-1, is present in the human pancreas and brain, but it wasn’t known to be present in the heart. This study, published in April in the journal Anesthesiology, confirmed the presence of the receptor in rodent hearts, which are similar in composition to human hearts. Using a laboratory method known as “western blot” to detect certain proteins in tissue, the researchers identified the presence of FFAR-1 in the heart. 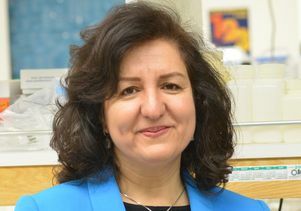 This technique, along with the direct microscopic examination of stained heart muscle cells, confirmed the presence of the receptor in rodent hearts. 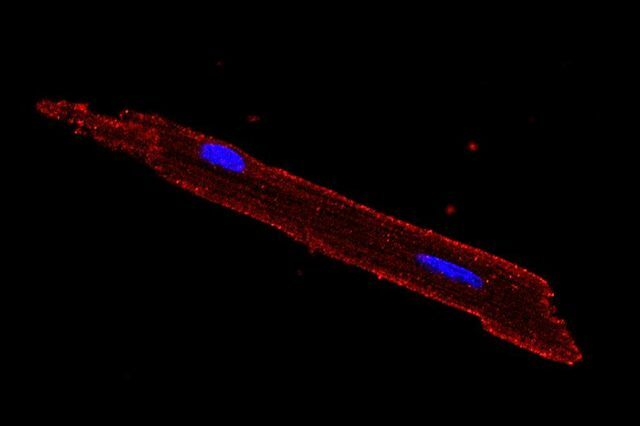 Mice and rats in which the receptor was not blocked experienced the repair of heart damage in response to lipid emulsion, while those in which the receptor was blocked did not experience such repair. These findings demonstrated that FFAR-1 was responsible for lipid emulsion’s reparative effects on the heart. 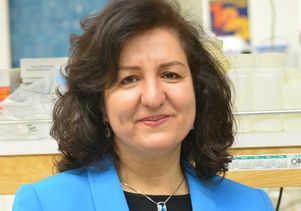 Mansoureh Eghbali, associate professor in the department of anesthesiology and perioperative medicine at the David Geffen School of Medicine at UCLA, led the study. 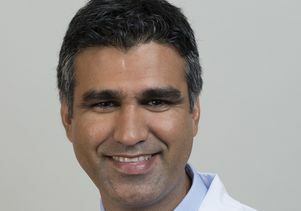 Other authors are Dr. Jingyuan Li, Dr. Kyle Hannabass, Mylene Vaillancourt, Christine Cunningham, Shayan Moazeni and Dr. Aman Mahajan, all in the department of anesthesiology and perioperative medicine at UCLA. The research was funded by grants from the National Institutes of Health and the Foundation for Anesthesia Education and Research. An immunofluorescence image of a mouse heart cell showing the presence of FFAR-1. Red: FFAR-1; Blue: Nuclei.